Noted Soviet aircraft designer Semyon Lavochikin had taken part in a design team that produced the LaGG fighters (the team consisting of Lavochkin, Gorbunov and Gudkov) in the early 1940s. While the LaGG-1 and LaGG-3 were reasonably successful, they were underpowered. Shortly after the design team was dissolved, Lavochkin undertook an improved design that incorporated a 1,600 horsepower ASh-82A radial engine on an all-wooden airframe. The resulting La-5 was a resounding success at low altitudes. Unlike its predecessors, the La-5 could out-maneuver the Bf 109F and Fw 190A below 12,000 feet, giving the Soviet Air Force a much-needed edge against the advancing German forces. Eduard releases Limited Edition series kits based upon tooling from other manufacturers and enhanced with Eduard details and decals. 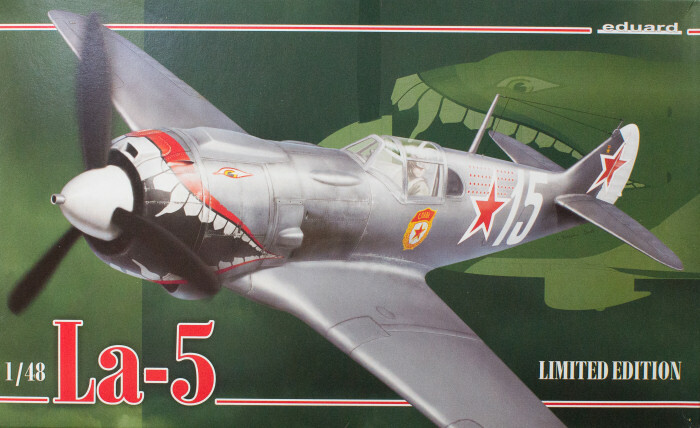 Such is the case of this release, this is the Zvezda 1/48 La-5 kit which is molded in light gray styrene and presented on three parts trees plus one tree of clear parts. Eduard adds one set of resin wheels, one fret of color-printed photo-etched details, one fret of standard photo-etched details, one nice decal sheet, and one set of yellow-tape masks. The decals are nicely printed and provide some alternative bort colors for Bort 42. You may also want to consult your references as Major Kostylev's La-5 is portrayed here in AMT-11 over AMT-7 With white spinner and rudder. This is evidently a popular subject though some show the colors differently like the Gran kit with a different camo scheme and yellow on the spinner and rudder. I don't know which is correct at the moment and there are even conflicting color profiles online. I'll have to dig through my Russian language history books for the Baltic Fleet Air Force operations to which 4 GIAP was assigned. As for the kit, Zvezda didn't spare the details as there are lots of things here that will never be seen when the model is built ready to fly. That ASh engine for example is all but invisible unless the gun hood is removed and the cockpit is likewise obscured unless that canopy is open. Nevertheless, this kit is very nicely done and with the addition of the Eduard parts, you've got a great piece of Soviet Air Force history on your scale flightline.